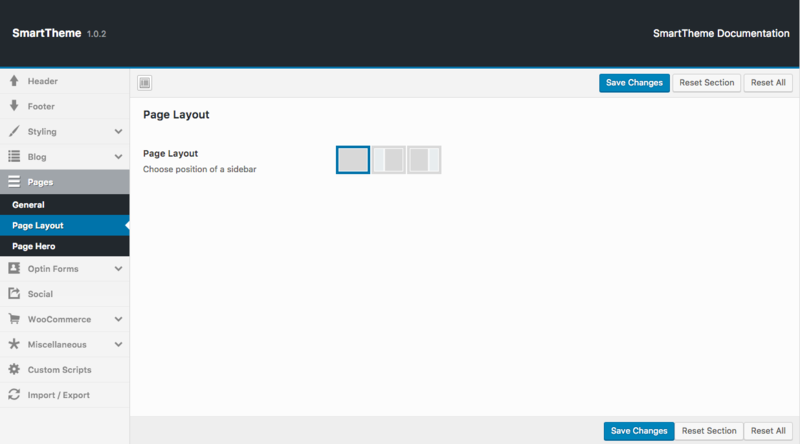 SmartTheme Page Settings is the place where you can change a wide range of options for your pages in your Website. 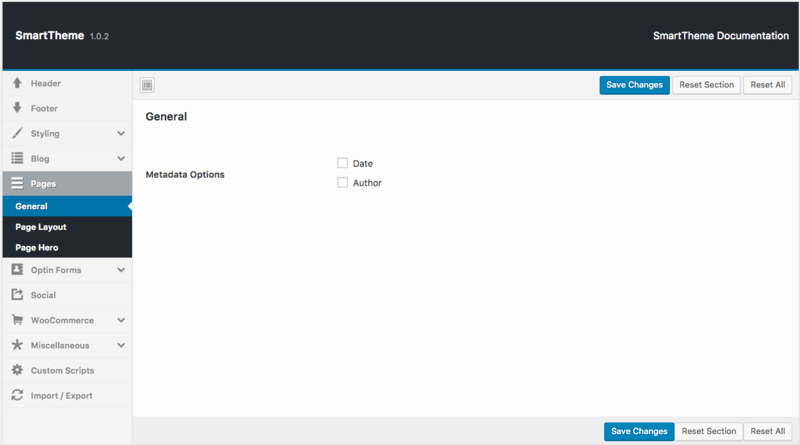 You'll find it on WordPress dashboard's Appearance > Theme Options > Pages. General is the first section we're going to talk about in the Pages Setting. What it does is display or hide the Date and Author of a Page Hero section based on your selection. This is how it looks when the Date/Author are unchecked and hidden. When you check these options this is how it should look. Note: These options are global for all of your pages, NOT for an individual page. Page Layout section is right below the General Section of Page Settings. You can choose, either you want a left sidebar, right sidebar or no sidebar at all for your pages. This section has the exact same settings of our Blog Post Hero section under Appearance > Theme Options > Blog > Blog Posts Hero. The first option we're going to take a look at is "Use Featured Image as Hero Image". 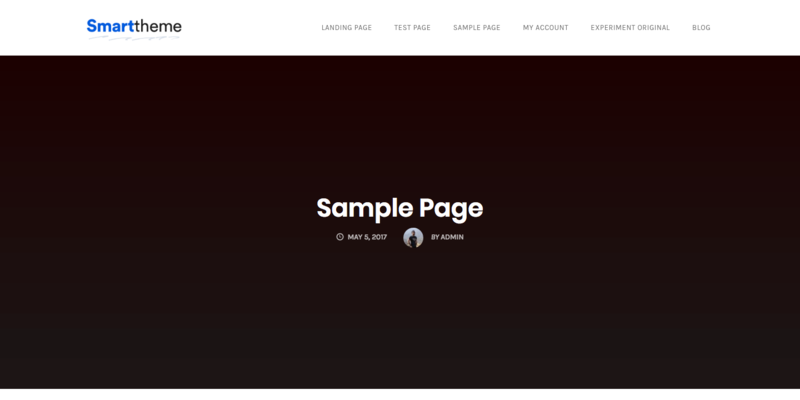 If you turn it on, the featured image of the page will show as the Hero Image on the front end of your page. If you keep it off by setting it to "no" a new option will appear "Show Featured Image in Page Content". If you allow the featured image to show, the featured image added to the page will act as the Hero Background image. If you choose to hide, the option "Hero Background Colour" will be used as the background color. You can choose 2 different colors for the background to form a gradient color palette. The "From" option is the Top part of it and the "To" option is the bottom one. If you set both of the color options exact same it can be used as a Solid background color as well. If you don't have any featured image for a post then the "Hero Background Colour" will automatically be in effect regardless of the option "Show Featured Image in Page Content". 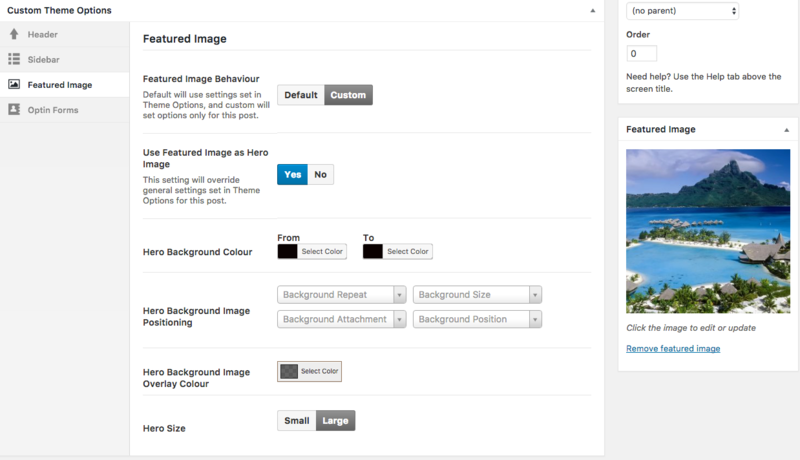 If you do not have a featured image you can always upload your own Hero image form these options here including some additional properties for the background image. This is global for all the pages which don't have a featured image. You can change the Background Repeat, Size, and Attachment status from here as well as the Overlay Color for the image. You can also change the text color and the overall size of the Image as Small and Large which is Large by default. Always remember to hit "Save Changes" for those changes to take effect. You can adjust some of these Page Settings from specific pages through the "Custom Theme Options" right below the Page content area for that individual pages. When you click "Custom" it gives you the exact same options as you have on the Global "Page Settings" section for Featured Image. If you click "Default" the page takes options from the Global "Page Settings". You can do the same for the "Sidebar" Option for the individual Pages here. Set Custom If you want the layout to be different from other pages. Default keeps the Global Setting in effect. 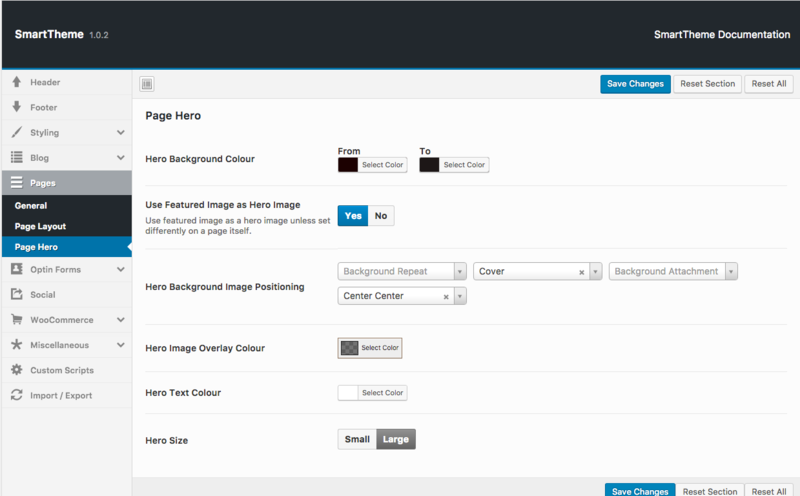 The same goes for the rest (Header, Optin Forms) of the items in the individual Page's "Custom Theme Options". After making those changes don't forget to "Update" the page to publish them.